What’s the verdict: Over two decades on from Reservoir Dogs, Quentin Tarantino threatens to do a total 360 and ape his masterpiece debut. A bunch of ne’er-do-wells holed up in one claustrophobic location. At least one of them not who they claim to be. Lashings of violence. Tim Roth and Michael Madsen in the cast list. Joined by Kurt Russell, star of The Thing, a movie that heavily influenced Dogs. You’d be forgiven for thinking QT had become stuck in the middle with himself. 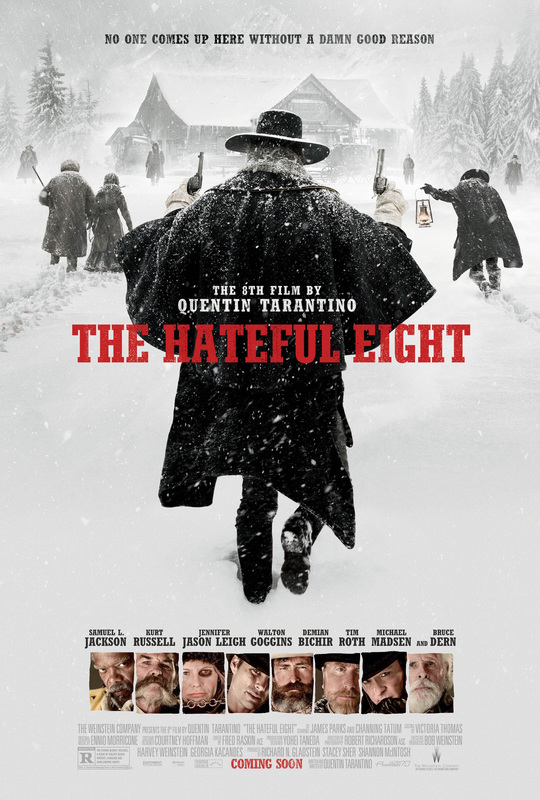 But, while The Hateful Eight is recognisably Tarantino’s sandbox, it sees the director revitalised. Maybe it’s the 70mm Ultra Panavision stock he shoots on, giving both the epic mountain vistas and the pores-in-the-skin close ups a grandeur last seen when Chris Nolan went Interstellar. Or the original music cues provided by Ennio Morricone, the first time Tarantino has gone beyond existing music (although that’s here too). Whatever, this is his most consistently rewarding and entertaining film since Pulp Fiction. Where Inglourious Basterds was a series of one-act plays loosely fitted together and Django Unchained was two hours good work undone by a wayward final forty minutes, The Hateful Eight is a film with one course that it drives to a memorably barmy climax. Not that Quentin rushes himself. A leisurely opening stagecoach ride takes roughly a third of the movie to reach the convenience store, the jovially named Minnie’s Haberdashery. Along the way we meet John Ruth (Russell), the bounty hunter escorting Daisy Domergue (Leigh) to her date with the hangman. They come across Marquis Warren (Jackson) and Chris Mannix (Goggins), the former a Yankee war hero, the latter a Confederate rebel with a disdain for dark skin shared by the deliriously racist Domergue. As the tensions bubbles, recedes then rises once again with every wrong word, joke or racial slur, the question is will anyone make it to Minnie’s? Once at the large log cabin in the mountains, they meet the second half of the dislikeable octet. Oswaldo Mobray (Roth) is coincidentally the hangman travelling to Red Rock town to ensure Daisy swings. Bob “The Mexican” (Bichir) is tending the shop in Minnie’s absence, while gunslinger Joe Gage (Madsen) is on his way to spend Christmas with his ma. General Smithers (Dern), a Confederate as bigoted as Daisy, is looking for his boy one year lost. Sensing an ambush Ruth takes the others’ firearms, but the night has plenty more surprises in store. Playing like an ultra-violent version of an Agatha Christie chamber piece, The Hateful Eight is a riotous mystery tale, ratcheting the tension as character secrets and motivations begin to flow along with the claret. Like all good Westerns, this is more a commentary on today than Wyoming, 1825. Racial tensions, military glory-hounding and gun violence all jostle for space, while the equal opportunities violence meted out to Domergue is likely to draw debate. Familiar QT tropes are present and correct. A knockout speech from Jackson’s Warren that closes the first section is a subversion of racial stereotypes and a filthy joke all in one. The film is broken into teaser-titled chapters, flashbacks judiciously come into play, and other films are liberally “homaged”, from The Thing (and its soundtrack) to wuxia great Dragon Inn to Western classic McCabe and Mrs Miller. The cast likely haven’t had this much fun in years. Russell is a grizzled delight, one part Big Trouble in Little China’s Jack Burton, three parts John Wayne. Roth slips into the Christoph Waltz part with palpable glee, Leigh’s wild turn reminds you just how much she’s been missed from big movies and Goggins proves how much he should be in them. But, Jackson dominates as a war hero who may have a secret or two, but won’t let that prevent him laying down his vengeance. By the end as much a Grand Guignol splatter pic as a Western (not for nothing are special effects supremos Howard Berger and Greg Nicotero credited second in the end titles), for those with strong stomachs this will be one of the wildest (and widest) cinema experiences of the year. If 70mm puts this much lead in Quentin’s pistol, he should shoot all his films this way.